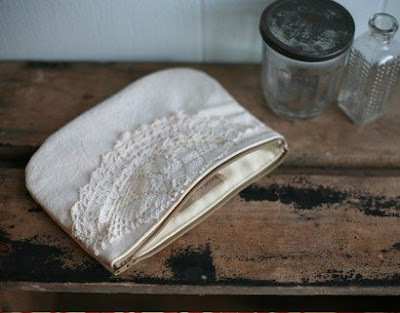 Made from Vietnam era military laundry and applied with antique lace. To go with your doily necklace, of course. Oh wow... elegantly beautiful, for sure. cute. interesting history for a handbag. Hopefully they would be friends. If they were, you could wear them together without worrying. But doilies are known for being jealous. Gorgeous. where do I sign up? Oh no, more doilies? I'm definitely going to see if I can raid the family stash this weekend. I'm pretty sure we have some unused doilies up in the attic. amanda...hilarious, i'm not sure if the doilies would be friends. but the bag is lovely!